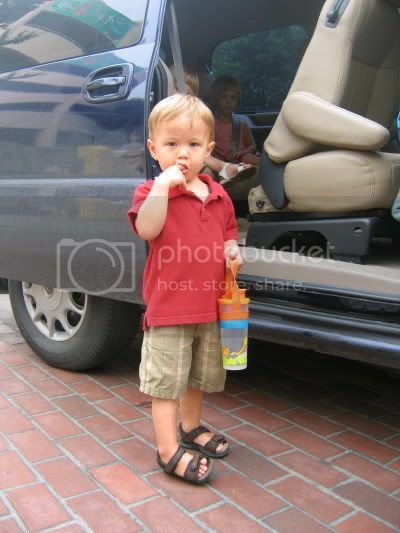 Here is a picture of our little man getting in the van the first day of school. A new International school called Eton House opened up in Chengdu and they offered a summer program for children between the ages of 2-6 for 4 weeks. We thought that we would send Angus just to see how he would do in this type of setting. Angus is really enjoying his time there. He has made quite a few new friends and has only had one incident where had to stay in from recess. On the Mommy front Gemma and Angus were both in summer school for one week and I had lots of free time. It was very nice and peaceful around here. I have been able to get caught up on quite a few things and feel very well rested. Gemma finished school last week, so we have had a lot of Mommy/Gemma time. Angus is getting so big! Can't believe he is already starting school. He looks really cute.